The availability of datasets providing information on the spatial and temporal evolution of greenhouse gas concentrations is of high relevance for the development of reliable climate simulations. Here we present a novel, non-dispersive infrared absorption spectroscopy (NDIR) device that can possibly act as a central building block of a sensor node to provide high-quality data of carbon dioxide (CO2) concentrations under field conditions at a high measurement rate. 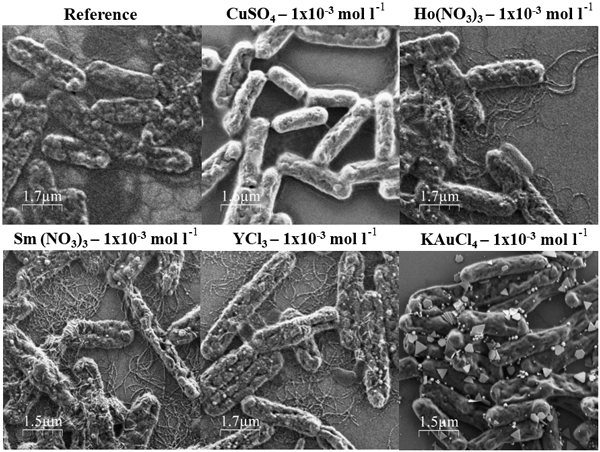 We assessed the applicability of bacterial surface layer proteins of Lysinibacillus sphaericus JG-B53 and Sporosarcina ureae ATCC 13881 for the detection of metal ions in water. Based on the interactions of the cell components with metal complexes, two potential sensor systems, one colorimetric with functionalized gold nanoparticles and the other using a regenerative sensor layer, were developed. The systems' detection limits of YCl3 in water were 1.67 x 10−5 and 1 x 10−4 mol L−1, respectively. For detection of benzene, a multichannel gas sensor system was tested in two different laboratories at the concentration range from 0.5 ppb up to 10 ppb. A model is used to extract the channels and multilinear regression is done to compensate cross interference to other gases. Depending on the measurement conditions, the quantification accuracy is between ±0.2 ppb and ±2 ppb. Regression models for one laboratory were transferable between the labs under comparable measurement conditions. We studied the problem of wireless indoor mobile robot localization and tracking using noise-free data and data with additive white Gaussian noise at three receiver positions. We proposed a new scanning method to overcome the drawbacks of fingerprint, which includes time-consuming construction of a database and its need for rebuilding every time a significant change in the environment occurs. A novel combustion airstream control concept has been developed based on in situ sensors for combustion temperature, residual oxygen concentration and residual un-combusted CO / HC components. The implementation of this control concept allows for a large reduction in toxic gas emissions by up to 80 % compared to hand-operated furnaces. A stable long-term CO / HC sensor for such an application is not available; thus, the long-term sensor signal stability of different CO / HC sensors is studied. The aim of this paper is to discuss different models that describe atmospheric transmission in the infrared. They were compared in order to choose the most appropriate one for certain atmospheric conditions. Universal models and different inaccuracies connected with them were analysed in this paper. There have been models analysed from the literature, and these are used in infrared cameras. Microcrystalline cellulose, microcrystalline nitrite powders of common formulae MNO2, (M = Na, K) and two-component materials (cellulose + nitrite) have been prepared and characterized by means of optical microscopy and luminescence spectroscopy.The method of determining the nitrite compound traces via their sorption by cellulose using luminescent properties of the NO2- molecular ion has been developed and the low limit of NaNO2 determination in water solution was evaluated as 0.035 mg/l. 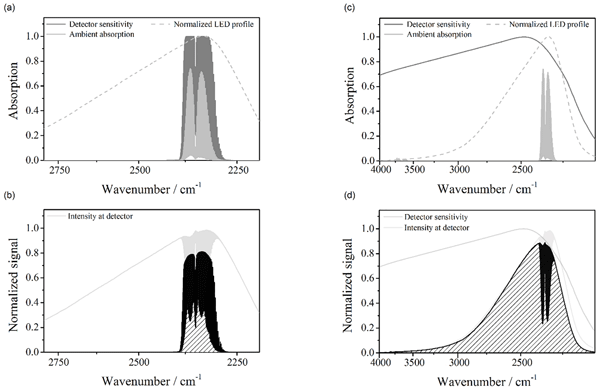 This study aims at the development of high-performance and cost-efficient gas sensors for sensitive detection of three specific hazardous gases, i.e., formaldehyde, naphthalene, and benzene, commonly present in indoor environments in concentrations of health concern. We used silicon carbide field effect transistors to investigate the sensor performance and characteristics under different levels of relative humidity up to 60%, demonstrating excellent detection limits in the sub-ppb range. In this article, we propose detecting hydrogen (H2) traces at room temperature with nanostructured PdPt/Al2O3 catalysts. We measure the temperature rise during the exothermic oxidation of H2 by the catalyst. An appropriate formulation of about 1 mg of PdPt/Al2O3 leads to reversible thermal responses of 3°C in only 5 s. We show that this active material is a promising candidate for autonomous and reversible passive transducers for H2 sensors working at room temperature in explosive atmospheres. An approach for detecting hazardous volatile organic compounds (VOCs) in ppb and sub-ppb concentrations is presented. Using metal oxide semiconductor (MOS) gas sensors in temperature cycled operation, VOCs in trace concentrations are successfully identified against a varying ethanol background of up to 2 ppm. For signal processing, linear discriminant analysis is applied to single sensor data and sensor fusion data. Integrated gas sensor systems using the same MOS sensors were characterized.